Ticket collection desks are open from 9.00 to 16.00. Attraction are less crowded early morning and late afternoon. We are comparing OMNIA Vatican and Rome City Pass with Free Transport Prices from leading ticket suppliers and Try to find you Cheap tickets prices on the market. The combined Omnia Vatican City and Rome City Pass is an ideal option for independent travellers to discover the wonderous Eternal City. You'll have the flexibility to plan your own journey, select your time slot and skip the line to the Vatican Museums, Sistine Chapel and St Peter's Basilica. Ride the iconic double decker Sightseeing Bus for between attractions, or stay aboard for the full loop. Take advantage of the free Hop-On Hop-Off app, on board Wi-Fi and multilingual audio guide. This pass also lets you visit 2 of Rome's top attractions free of charge, the 5 attractions available are: Rome Colosseum, Castel Sant'Angelo, Borghese Gallery, Capitoline Museums, or Palatine Hill and Roman Forum. Whether you interested in modern art, renaissance art, the history of Rome and the Catholic Church, the rule of the Roman Empire, sightseeing, or just wanting to tick a few famous locations off our bucket list, the combo OMNIA Pass is a must when visiting Rome. The pass includes attractions which will appeal to visitors of all ages. Your Experience With OMNIA Vatican and Rome City Pass with Free Transport? 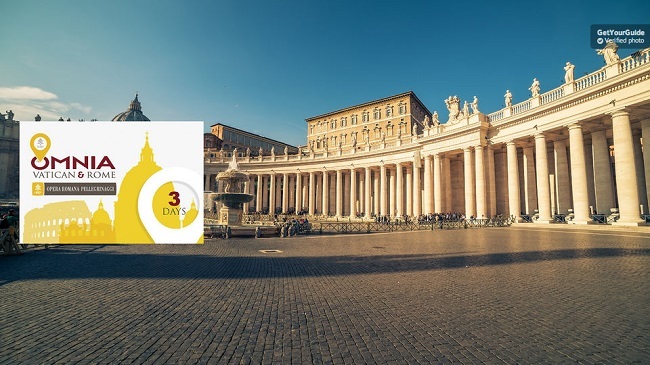 Enjoy 3 days access to Hop-On Hop-Off Sightseeing Buses, free or discounted entrance fees and skip the line tickets to some of Rome's top attractions. Get free, fast track entrance to the Vatican City's top attractions including the Vatican Museums, Sistine Chapel and St. Peters Basilica. Chose your own itinerary and explore the Eternal City at your own pace. What OMNIA Vatican and Rome City Pass with Free Transport Includes? 72 Hour Omnia Vatican City and Rome City Pass. Unlimited use of Hop-On Hop-Off Sightseeing Buses, with audio guide, Wi-fi and headphones. Free skip the line entrance to Vatican Museums, Sistine Chapel and St. Peter's Basilica (with audio guide). Free entrance to 2 of Rome's 5 top attractions. Discounted entry to over 30 attraction/museums in Rome. Free city map and guidebook. Free entrance to 2 of the following: Colosseum, Palatine Hill and Roman Forum, Castel Sant'Angelo, Capitoline Museums, Borghese Gallery. Free fast-track entrance to: Vatican Museums, St. Paul's Basilica, St Paul's Basilica, Sistine Chapel. Skip the line entrance time must be reserved in advance. Travelers Reviews about OMNIA Vatican and Rome City Pass with Free Transport? Travellers say that this is a very convenient pass which saves the hassle of purchasing entrance tickets to each location separately. Comments generally agree that the pass is easy to use and good value. The OMNIA card an overall score of 4 out of 5 on both TripAdvisor and Viator and a 4.3-star rating from over 1,000 customers on Get Your Guide. Printed or electronic vouchers can be exchanged for the Omnia Vatican and Rome Pass at Tourist information points in the city. Check with ticket provider for cancellation policy. Ticket collection points, Vatican Museums and Sistine Chapel will occasionally be closed (Specifically for Easter celebrations). Groups larger than 9 may not be permitted to enter together. Skip the line entrance is for specific time slots, this can be booked after collecting the pass. Tourist information point are located around the city or on St. Peter's Square.